Sunday January 29, 2017 was a big day here in Kenya as we dedicated two churches for the PCEA Church, one in Rugongo and one in Karura outside of Nairobi. There is something unique about every church we dedicate. PCEA Rugongo Church has only thirty members. The area is quite poor, but these thirty members persisted and even completed their church in three years. 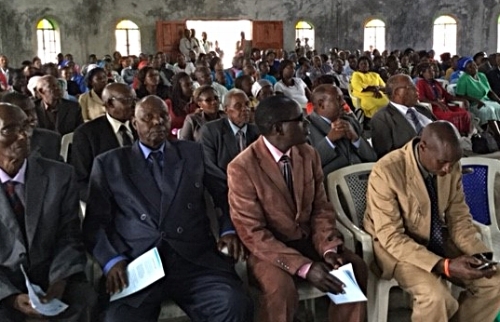 Most of the church members are senior citizens, and all the church officers are women. When PCEA church officials visited with me about nine months ago, they were completely exhausted and needed some assistance to complete the church building. They didn't need much. They only asked for windows and doors and some finishing touches. All they needed was a little encouragement and a small push. Even though they only have a few members, the church was packed at the dedication. We hope that with the new building, the church membership will triple in the next few months. That's what usually happens. The Deputy Secretary General officiated at the dedication and preached a very good sermon on Amazing Grace. The second church dedicated was PCEA Karura. The ceremony was well attended. PCEA Secretary General Rev. Peter Kaniah officiated at the dedication. As with the Rugongo church, we helped the Karura church with windows, doors and a roof. These are the most difficult and most expensive project for churches to do. I want to thank First Presbyterian Church in Nashville for their most generous help in completing these two church buildings. Read more about PCEA Stone Church Construction in East Africa by clicking HERE. Outreach is seeking gifts totaling $120,000 for four churches at $30,000 each.